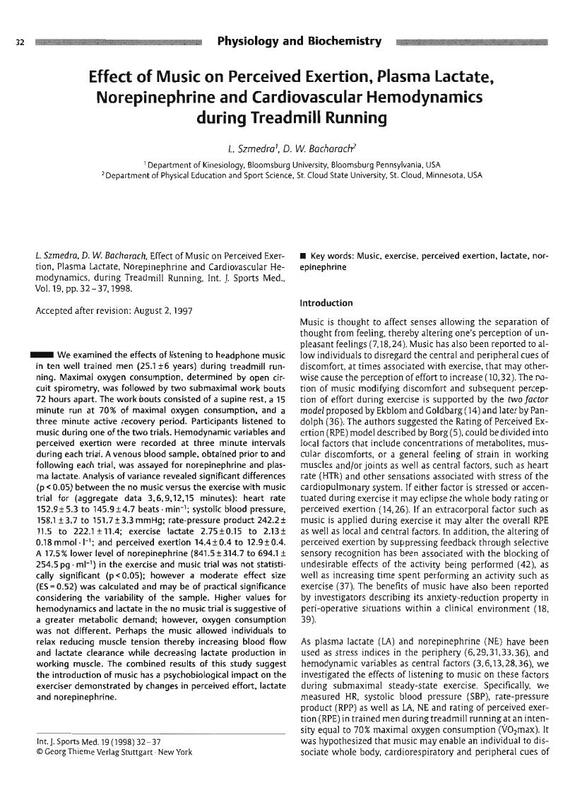 We examined the effects of listening to headphone music in ten well trained men (25.1 ± 6 years) during treadmill running. Maximal oxygen consumption, determined by open circuit spirometry, was followed by two submaximal work bouts 72 hours apart. The work bouts consisted of a supine rest, a 15 minute run at 70 % of maximal oxygen consumption, and a three minute active recovery period. Participants listened to music during one of the two trials. Hemodynamic variables and perceived exertion were recorded at three minute intervals during each trial. A venous blood sample, obtained prior to and following each trial, was assayed for norepinephrine and plasma lactate. Analysis of variance revealed significant differences (p < 0.05) between the no music versus the exercise with music trial for (aggregate data 3,6,9,12,15 minutes): heart rate 152.9 ± 5.3 to 145.9 ± 4.7 beats · min-1; systolic blood pressure, 158.1 ± 3.7 to 151.7 ± 3.3 mmHg; rate-pressure product 242.2 ± 11.5 to 222.1 ± 11.4; exercise lactate 2.75 ± 0.15 to 2.13 ± 0.18 mmol · l-1; and perceived exertion 14.4 ± 0.4 to 12.9 ± 0.4. A 17.5 % lower level of norepinephrine (841.5 ± 314.7 to 694.1 ± 254.5 pg · ml-1) in the exercise and music trial was not statistically significant (p < 0.05); however a moderate effect size (ES = 0.52) was calculated and may be of practical significance considering the variability of the sample. Higher values for hemodynamics and lactate in the no music trial is suggestive of a greater metabolic demand; however, oxygen consumption was not different. Perhaps the music allowed individuals to relax reducing muscle tension thereby increasing blood flow and lactate clearance while decreasing lactate production in working muscle. The combined results of this study suggest the introduction of music has a psychobiological impact on the exerciser demonstrated by changes in perceived effort, lactate and norepinephrine.